Salads you can make ahead that last for days! Stop throwing out your veggies and make them into delicious salads instead! Are you bored with your few standard salad favorites and looking for some variety for your low-calorie lifestyle? Are you trying to eat more veggies but can’t stand the thought of another veggie platter? Are you a vegan or raw-foodie who is desperate for some amazing new recipes that don’t take hours to make? Then check out the wonderful selection of 85 different refreshing salads in this RAW MAKE AHEAD SALADS recipe e- book! These are not your typical leafy green salads that wilt as soon as they get some dressing on them, but are crunchy, colorful and bursting with flavor! Always a hit at pot-lucks, picnics and BBQ’s, the salad recipes are all filled with nutritious raw, vegan, gluten-free and dairy-free ingredients. Even people who aren’t into ‘health food’ love these tasty creations and usually ask for the recipe. Each salad can be made ahead and lasts for 3 or 4 days in the fridge. It’s fun to make several at a time to have healthy choices available when you’re feeling snacky! RAW MAKE AHEAD SALADS is a convenient book to have on hand to help you and your family to eat more vegetables. You can play around with the recipes and adapt them to your own tastes or use them as inspiration to create your own! “I’m so excited about this book! I’ve made many of the different salads for company and they all loved them and wanted the recipes! I really think this book is awesome and I want to buy one for all my friends!” …..Marianne, Victoria, B.C. 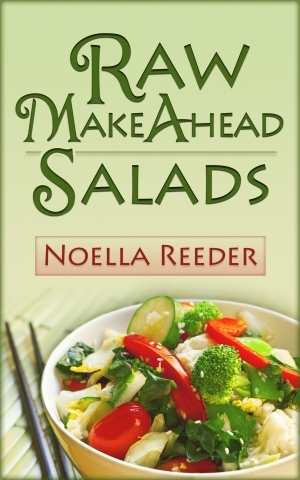 “The thing I love about this book is it gives me a base of salad recipe ideas to work from. I know I can add or replace certain ingredients to my own taste or based on what I have on hand. I added some chopped pear to the Carrot Mango Ginger Salad and it was great!” …..Karen, Cedar B.C. “I like that all of the recipes in the Make Ahead Salads book are made with easy and simple lists of recognizable ingredients.”….. Nancy, Nanaimo, B.C. It’s affordably priced at under $10 – approximately $6 – $8 depending what currency you pay with! Click here to purchase at amazon.com Kindle Edition – U.S.